The City of Copenhagen released its latest mode share data yesterday and the numbers look fantastic. 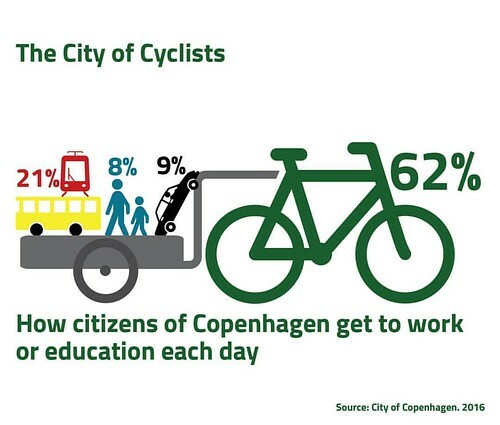 62% of residents in the City ride a bicycle daily to work or education in the city. 21% take public transport, be it bus, metro or train. Only 9% drive a car - even though car ownership is around 25%. Basically, 91% of our citizens DON'T drive a car in the city - here in one of the richest countries in the world. All good, right? 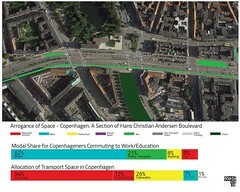 You would think so, but even Copenhagen suffers from a serious case of Arrogance of Space. 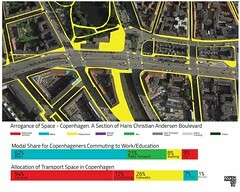 We took a section of Hans Christian Andersen Boulevard - the 1950s urban planning travesty that carves the Danish capital in two - and did a quick arrogance of space analysis. It's the busiest street in the Kingdom with between 50,000 - 60,000 cars a day roaring past, most of them firmly in the "parasite" category. These are not people who live in the municipality and who therefore do not pay for the road space that we provide them. There has been talk for years of burying this street and reclaiming the space it occupies. While not a bad idea - albeit an expensive one - it wouldn't remove the cars from the city, since they would pop up out of the tunnel at some point. 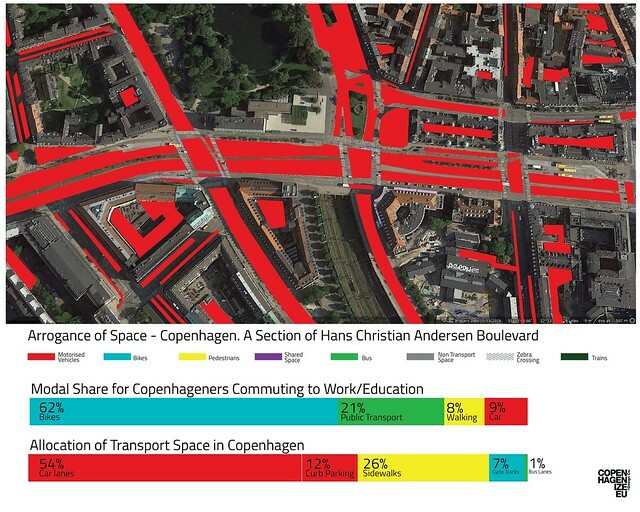 As you can see on the graph, a whopping 64% of the transport space in Copenhagen is allocated to cars - both car lanes and curb parking. This is most apparent at the location we are looking at here. When we map out the space allocated for cyclists, it looks like this. There are 26,400 cyclists along the boulevard on weekdays, according to the latest count in September 2016. Add to that around 10,000 who merely cross the boulevard from the side streets. 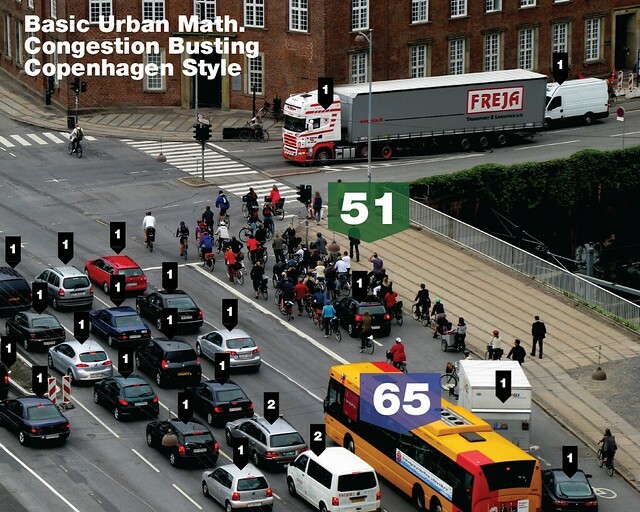 Certainly not one of the busiest bicycle streets in Copenhagen but the numbers are respectable. On the map you can see how the infrastructure is part of a cohesive network. Here is a snapshot of one light cycle in the morning rush hour from this location. Here are the maps for the space occupied by bus lanes or trains, at left, and the space allocated to pedestrians, including squares. The trains are not relevant for this exercise, as they disappear underground, but buses are a key transport form on this corridor. 360 of them roll past between 7 AM and 7 PM. With an average capacity of 50 passengers, that would add 18,000 people moving back and forth along this stretch. And yet there is a severe lack of dedicated space for them. Out of interest, here is a map of the "shared space". Not the classic and cute "shared space" that works in small, rural towns and residential neighbourhoods but merely parts of the transport area without separation. What IS relevant is this. The amount of urban space given over to motorised vehicles. Most of it handed free to motorists who do not pay taxes in this municipality. Motorists, it is worth mentioning, already have it easy in Denmark. It's cheaper to buy a car today than during the oil crises in the 1970s and the same applies to gas, rendering the tax on cars here rather irrelevant. 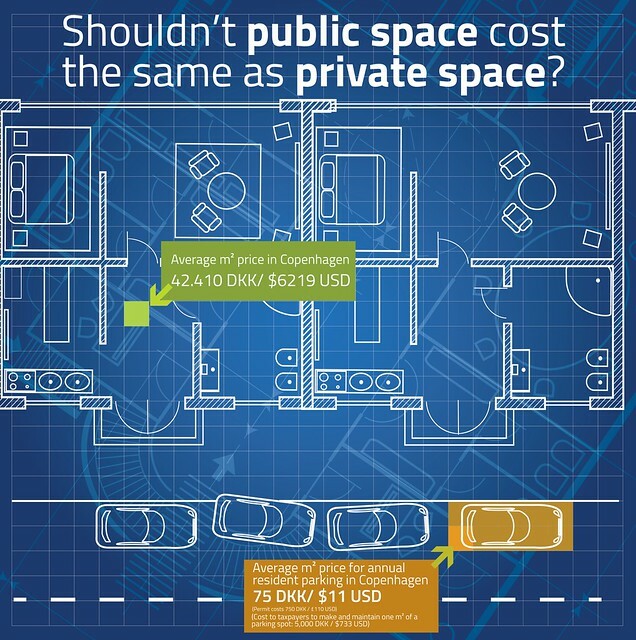 In addition, a resident's parking permit only costs around 750 DKK (€100) per year - despite the fact that a parking costs the city - and the taxpayers - around 50,000 DKK (€6,600). Here is the complete map with all the transport forms together. The Arrogance of Space is clearly visible. 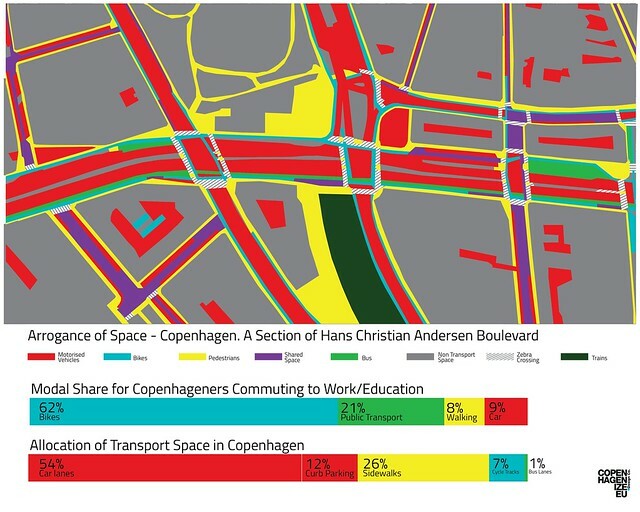 There is a total disconnect between how Copenhageners get around and how the space is divided up. This is not urban democracy on this boulevard at all. It is the same car-centric dictatorship that so many other cities in the world suffer under. Yes, it is safe to cycle along this stretch, on separated cycle tracks. But this is not transport democracy. This is not the Copenhagen that inspires so many people around the world. If we valued public space in an economic sense as much as we value real estate value - instead of a massive majority subsidizing the transport habits of the few, we would be much better off. Here is just one idea of how to reallocate the space more intelligently. We would be more rational and this city would be not only healthier and more dynamic - it would be the leader that it should be. See more articles about Arrogance of Space with this tag.